Time price square outs suggest that if may be difficult to go below 7724, but then we are in a time band of heightened volatility. 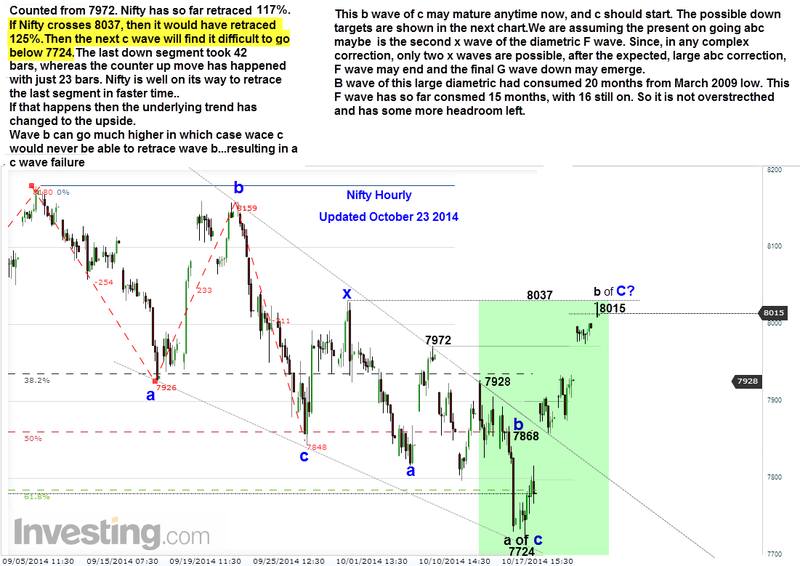 Nifty`s break out from 7724 has happened at an 81 degree upward slope. In two leaps, it had taken out both the 45 degree down lines from previous peaks. Unless something very dramatic happens, it is hard to visualise Nifty going below 7724 immediately.7900 and 7850 look likely downside targets.C wave mentioned above should terminate here, if Nifty obliges. Being in the market, we should of course be prepared for any eventuality and have adequate protection of our positions. For the past several weeks, I had been highlighting the destabilising effect of Rahu, when first Mercury was conjunct with her, then Sun , then Venus and then Mercury again when he was retrograde. Now for the last time Mercury will again conjunct with Rahu this week. This can have a negative impact on the market. Mercury is the significator for communication and he is conjunct with Rahu on Oct 29/30. This happens to be the day of FOMC meeting. Coming to Mercury again, we had observed that when Mercury went retrograde on October 04, no change in trend happened. Nifty continued to drift down when the markets opened after Puja holidays. We have seen that if a trend change does not happen when Mercury goes retrograde, then it will happen during the mid period. Accordingly we saw a bottom at 7724 on October 17. Another factor was the powerful Sun Pluto followed by Venus Pluto squares which were indicating bottoms. Look at the reversals everywhere. They are quite powerful is it not? Coming back to Mercury, when he becomes direct, the trend will change again. So a top formation is round the corner. Now add Rahu`s destabilising effect, and we could have a quick down move. Redeeming factors from a bull`s point of view is that Jupiter is sextile to Rahu and Mercury and trine to Ketu. So the damage will be contained. Also both Ketu and Jupiter are in Mercury stars. Now that Mercury becomes direct, energy flows might improve. I had also pointed out in a different post, the effect of Solar Eclipse. 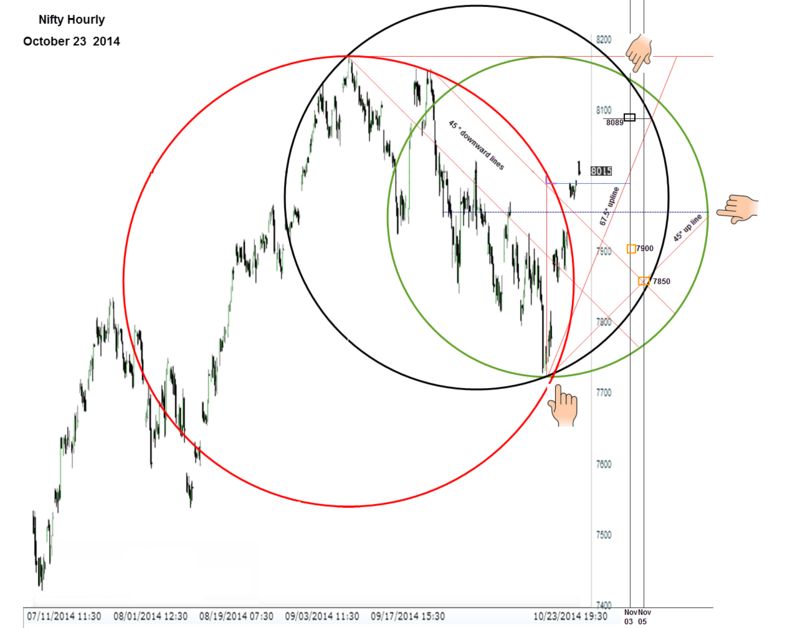 That also points to a bottom formation after the eclipse. So all told the coming week will be very volatile and the bias is negative. Mars is going into extreme declination. That is another negative.Mercury also is moving slowly. It has to pick up speed if things have to improve.Sun is in debilitation, in Libra. Time cycle wise. November 3 to 5 seems to be a bottom formation time..
Jupiter is going to square Venus, Sun and Mercury.Mars and Pluto are going to conjunct and then Mars will square Uranus. All three fast moving planets will have to meet Saturn in Scorpio. But those can be examined in a separate post.